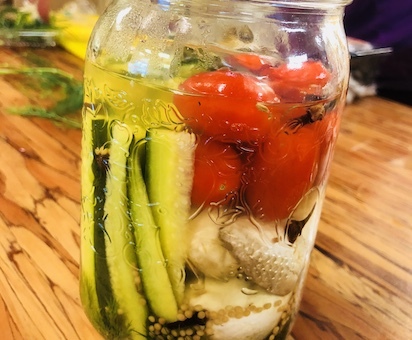 This Big Kids Club is focused on showing kids that the food they eat often involves bacteria and a fermentation process. 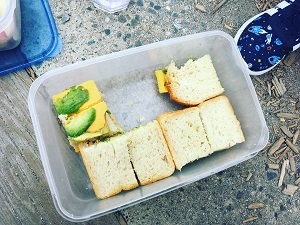 That’s why teacher Aïda made the sourdough bread sandwiches as our snack, and told the process to make them. This kind of bread takes longer to make because the starter goes through a fermentation process over a few days time. 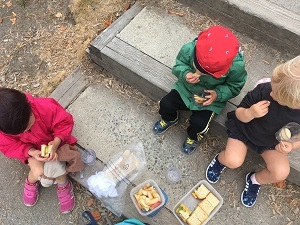 The kids were interested in how it's made, and enjoying them during the field trip snack time. We also made soup with the fermented paste. Do you know what it is? It is Miso! It's made from fermented soybeans and barley or rice malt. People in Japan have miso soup with some veggies, tofu, or sometime noodle almost every day. 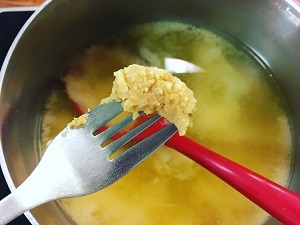 When the kids tasted the miso paste, they said "It's salty!" However, they kept saying "Can I have more, please!" Then we made and served miso soup. Of course we all loved it, and said "This bacteria soup is yummy!" I've been talking about sandwiches, miso soup...and the last one is about Kombucha! That has become very popular over the last few years and is very simply fermented tea! 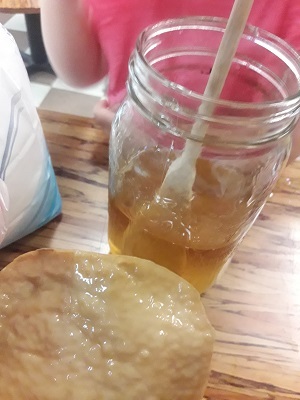 We take a bacterial culture named a scoby, it almost looks like a mushroom, and we place it in a mixture of tea and sugar. We showed the process of making kombucha to the kids. We placed a tea bag in a jar of water and we left it in the fridge pretending that we were making cold tea. Just an hour later we could see that the water had gone completely orange and then was the time to add our sugar. Afterwards we showed them the scoby and into the mixture it would go (if we had 14 days to wait), this time we cheated and we brought some from the store to try. 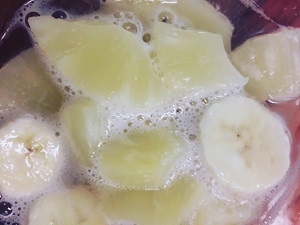 We added pineapple and banana to the kombucha and made a wonderful drink we called a kombucha-colada! That was a big hit for everyone! "Bacteria" sounds YUCKY, but it could be YUMMY, and helps our health a lot! Let's eat them and be healthy together!